Over the last few years we have chosen to ditch the artificial Christmas tree and buy a real one. However, this year it felt like it took us ages to find the “perfect” tree. Some were lopsided, some were sparse at the top, whilst others were top heavy, then some had gaps in all the wrong places. When we bought a piece of furniture made of real wood, as opposed to previous pieces made with veneer, I thought they were faulty because of the dents which exposed knots created in the grain of the wood. I have learned that the knots are blemishes in the tree and I have come to love these imperfections. I discovered that often they are caused by the natural growth of the tree, but sometimes the way they appear comes from specific circumstances in which they are formed. For example, when a branch becomes injured or dies while still attached to the tree, a loose knot forms as the trunk grows larger. Some knots are formed by excessive pruning and others through disease. You see, we all have our different foibles, weaknesses, quirks and imperfections, but loss, hurts, disappointments, broken dreams, sickness and even the loss of a loved one can also leave a mark on our lives. Like a knot on a tree. However, it’s important that we see the beauty God can bring out of our imperfections and pain, like the rich flowing grain of wood which grows around the beautiful and unique patterns of a knot. Those knots that may have been formed through injury and pain, are often turned into habitats for nesting birds. The same is true of our pockets of pain: A lady I know set up a ministry to help girls who struggle with addictions. This ministry was set up out of the mark left on her own life through her own personal struggles. Now, this woman has created a habitat for girls to be healed and recover from their struggles and difficulties. She allowed her ashes to be turned into beauty by God’s grace. On the other hand I know of others who have allowed their times of pain to become infected with bitterness, resentment and unforgiveness. Ashes, if not turned over to God’s grace, will simply grow into bitterness, not beauty. Whatever you have been through, whatever marks and scars you bare, trust the Lord to work all things together for good. 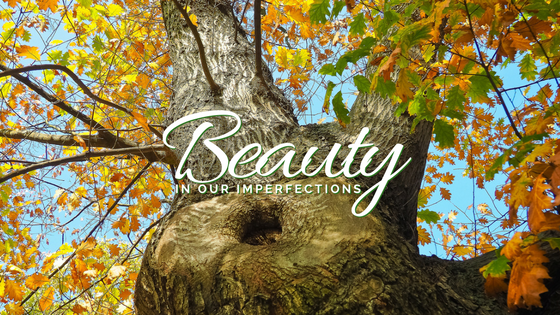 Then beauty will flow out of your imperfections, whatever they are, and like my Christmas tree, you may not be perfectly symmetrical, but you will be the real deal – a true beauty in God!